This Friday when her employees don't get paid would be an ideal moment for Kristjen Nielsen to resign in protest. It might be the one thing she could do at this point to try to rehabilitate herself. Is there any reason to suspect or to even hope should would do something that would amount to a grand gesture? I've seen zero indication that she's anything less or more than a xenophobic, prevaricating, paleo.... in short, 100% Trumpette. No, I can't imagine her being loyal enough to her staff or the nation to do something that principled. Last edited by d4m10n; 6th January 2019 at 10:37 AM. Trump is having problems finding a new Sec of Defense, with at least wo prominent canidates turning it down. Who can blame them? Maybe they're hearing him ask if they want to be "Secretary of The Fence". Working for the current White House has become the epitome of the "career-limiting move". Pence shows as much life as a hibernating bear. So if they fire him, who is going to notice? It would be like emptying the trash can. As an elected official, Pence cannot be fired by Trump. Demoted, then. To Chief Footstool. Oh wait. He is that already. Just assign him an all-female Secret Service detail - he would have no choice but to resign. The talk is that Rosenstein will be going once Bar is confirmed. If I were Rosenstein, so would I.
Kushner is taking longer than advertised to fix our relationship with Mexico and China, reform from the ground up the Veteran's bureau and the tax code and bring peace to the Middle East. Trump should fire him and get someone to get these few things in order. Who told him to do that?! What a waste of talent! Donny is in deep trouble and needs some handy scapegoats around in the White House to foist blame on. Get Jared back there stat! Let's hope the new AG takes a hands-off approach. Last edited by d4m10n; 12th January 2019 at 01:04 PM. Empty Headed Animal Food Trough Wiper? Or Keeper of the Royal Stool? Would you care to clarify which meaning of "stool" you are referring to? The one you are probably thinking. The job of Keeper of the Royal Stool was to collect the King's #2s and determine by their size, shape, texture, and bouquet, whether the King was still in good health. It's an alternate name for "Groom of the Stool". It is...apropos for Jared. I actually knew that, but thanks. A lot of swanning around! Sorry, but it got teed up and I had to hit it. Trump reportedly swore at acting chief of staff Mick Mulvaney during a recent meeting with the Democrats. President Donald Trump lashed out at acting chief of staff Mick Mulvaney during a Situation Room meeting with Democrats, including House Speaker Nancy Pelosi and Senate Minority Leader Chuck Schumer, earlier this month, a White House official said Sunday. According to the official, Trump cut Mulvaney off toward the end of an unproductive meeting on re-opening the federal government, as Mulvaney was attempting to negotiate up from the $1.3 billion Democrats offered the White House. "Stop, stop, just stop -- What are you doing? You're ********** it all up, Mick," Trump said, according to the official who was in the room for the negotiations. The mistake was probably that he was making a legitimate attempt at negotiation. I'm rather mystified that legislative negotiations are being held in the Situation Room. "He" as in Mulvaney? Doesn't Mick know Donny is the best negotiator? Look at the deal he struck with the Dems! MUCH better! Given the White House laundry staff are probably furloughed and Trump's diet...WHEW. And another one bites the dust: RAJ SHAH, senior White House spokesman. Raj Shah, a top spokesman in the White House press office, has left and joined an arm of a Florida-based lobbying firm, officials said Monday. His departure comes as the White House press and communications teams have been depleted. 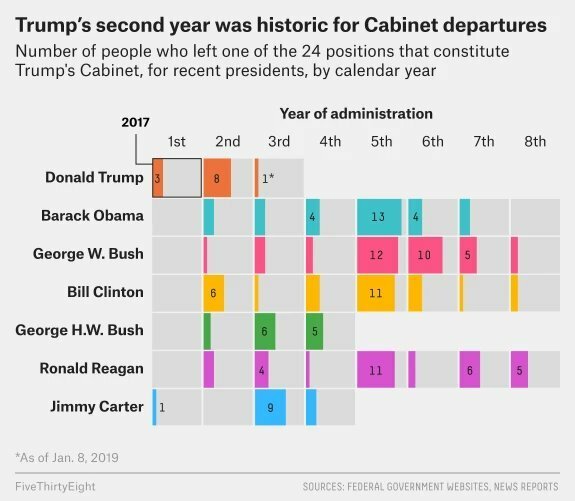 Several aides have moved on to roles at government agencies or have left the Trump administration entirely. It also probably doesn't help that he is obviously not a 'Murican. Of course not. He was born in Connecticut. And worse yet, he graduated from Cornell! But he's BROWN! And an INDIAN! So he's a MUSLIM! AND he was born in Connecticut. Like I said, obviously not 'Murican. Connecticut is in, like...Pakistan. Right? It's not too far from Boston...that's Pahk-istan. No phones or recording devices are allowed in the Situation Room. Next! Wess Mitchell, Assistant Secretary of State for European and Eurasian Affairs. This is the post that deals with the EU. The US State Department's top diplomat focused on Europe policy has resigned his post, effective February 15. In a letter to Secretary of State Mike Pompeo date January 4, Assistant Secretary for European and Eurasian Affairs A. Wess Mitchell said, "I feel that I have completed what I set out to do in taking this position."